It's confession time. I used to have a pair of slippers. Not a big confession huh? Well, there's more. These weren't your every day average slippers. I loved these slippers. Why? Well, they were pigs. They were pink and had big pig heads on the front of them...with pigs feet coming from the front and back...and yes, even a pink curly pig tail. You're probably thinking that I was very young when I had these right? I had them even in my 30's! I loved those pigs...and was so sad when I had to throw them out because the bottoms wore out. My card today is sort of celebrating those slippers...except they aren't pink pigs...they are green bunnies! The image is from Doodle Pantry and the paper is from a new pack from DCWV I got using a gift card. The bunny slippers are actually colored a lime green with pencils...but it's light and didn't photograph well at all. Digi Haven - Baby It's Cold Outside....so wear bunny slippers - LOL!!! Thanks for stopping by today and spending a few minutes of your day with me. God bless you!!! How cute are those bunny slippers? Great play on words. It is delightful to see your wonderful art posted in this week’s creative challenge at Word Art Wednesday. Super cute bunny slipper!!! I have this same pack of paper, love it! Great job! Such a cute pair of bunny slippers, Zella. I am sure that your pink pig slippers were just as cute. Super sweet slippers! Darling card! Thanks for joining Creative Knockouts! What a sweet card, Zella. Thanks for sharing it with us. I always enjoy your sweet art. What an adorable card! Love the bunny slippers image and the colors you used! I think it's awesome that you had piggy slippers! I had some dinosaur feet slippers in my 20's and they had some dohicky built in them so that when you stomped around in them they roared! LOL! Thanks for joining us at Shopping Our Stash! Oh so sweet! Love these colors together too. So sorry you had to part with worn out piggie slippers! Thank you for entering Doodle Pantry Digital Challenge 42! Beautiful Project. 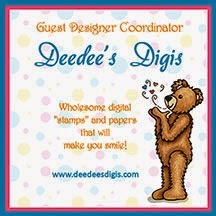 Thank you fro joining us at Stamping Dragon Design. Hope to see you again.